Yes, that's right, I do miss her already. Shelby just got on the bus 15 minutes ago and I am already missing her like crazy. I cant believe that summer is already winding down and school has started. I was dreading sending Shelby back to school but I *think* it is for the best. I decided to send her on the bus for the first day and she loved it!! It makes it so much easier to say goodbye when she is not crying. Look at that picture, a smile even! How nice that Shelby loves school and the bus. Those are cute pictures. what a big girl~! she is so beautiful...just like her mama~! You are such a good mom. Shelby looks so cute. I hope that the first day was a good one. I hope whenever we have kids that I'll be able to do their hair that cute. I'm kind of lazy with my own, so I've always been a bit paranoid that I won't be able to do little girls' hair. She is adorable! Good for Shelby. She looks so cute. How's it go? I mean, how'd it go? It went really well. She was happy when I picked her up. She said she loved it! 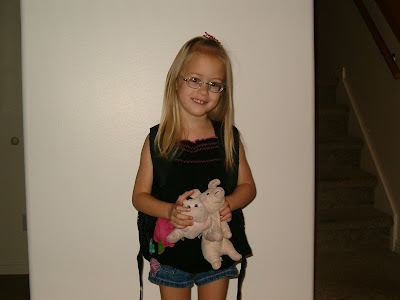 I can't beleive how big she is... she's got long skinny legs like her mom! Brad starts school next week... I can't wait! :)I'm glad she is liking school and the bus! Be strong Rachelle :) I heard the Fishin' in the Dark song yesterday and it reminded me of you. We really should do lunch. She looks so cute. 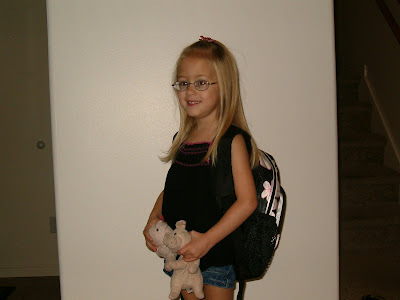 I will be doing the same thing in a week and a half when I send Camille off to her first day of preschool.